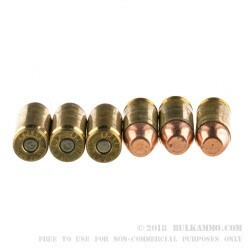 The .40 S&W was designed from the ground up for use by the FBI and police agencies. It boasts accuracy and drop similar to that of a 9mm, with terminal energies surpassing the output of .45 ACP. It's no wonder that police and civilians alike choose the round for their personal defense needs. But to use a firearm responsibly in a dangerous situation, you first need to get in your fair share of practice. Speer had exactly this in mind with their .40 S&W clean-fire cartridge. The TMJ projectile is inexpensive, and the clean-burning powder is conducive to repeated use without immediate cleaning. This facilitates extended trips to the range, giving you the opportunity to hone your accuracy and other shooting skills. 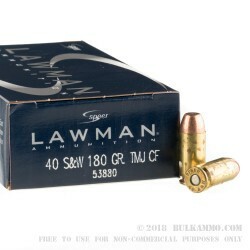 Speer Lawman's .40 S&W 180 grain TMJ produces 400 foot pounds of muzzle energy and travels at 1,000 feet per second. It's boxer-primed brass casings are safe for reuse. 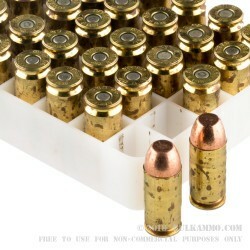 The ammo is packaged in plastic trays of 50 cartridges each, boxed in Speer Lawman branded cardstock. This case contains 20 boxes of ammo.